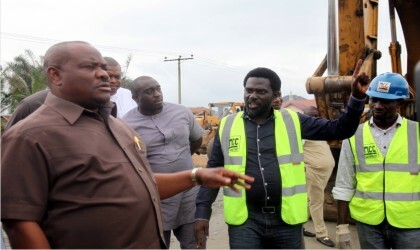 Governor Nyesom Wike of Rivers State, with Project Manager, Monier Construction Company, Mr. Collins Wonodi (2nd left), during the inspection of the Rumuolumeni Road project by the governor in Port Harcourt recently. The Vice Chancellor of Ignatius Ajuru University, Port Harcourt, Professor Rosamund Osahagulu,who was kidnapped on June 20 and released by her abductors on June 26 has been sacked by Governor Nyesom Wike with immediate effect. Her sack may not be unconnected to the saga concerning her alleged abduction that has been under police investigation. In statement signed by Mr Kie Obumanu, Director of Media and Publicity in the office of the Secretary to the State Government, SSG, today, ordered Professor Mrs Osahagulu to proceed on compulsory leave and hand over to the Deputy Vice Chancellor with immediate effect. No reason was given for her sack. The female Vice Chancellor who was abduction by gunmen as she was leaving the campus of the Rivers Government-owned institution and released six days later has been under investigation by the security agents on circumstances surrounding her alleged kidnap. Two weeks after her release, the University management slammed a three-month suspension on her husband, Professor Joshua Osahagulu, for alleged conspiracy in the kidnap of his wife. But the university branch of Academic Staff Union Universities, ASUU, has kicked against the suspension of Prof. Joshua Osahagulu, describing it “as unfair and unjust” and has called on the management to reverse the decision until a thorough investigation is carried out on the matter. ASUU Chairman of the university, Dr. Ugochukwu Agey said the union is pissed with the way Prof. Joshua Osahagulu was hounded with suspension simply based on the statement he made over the abduction of his wife without thorough probe into the circumstances surrounding the abduction of his wife. As at the time of filing this report, it is unclear what the evidence before the university management is, before it suspended Professor Osahagulu. “We are aware that he has been suspended without thorough investigation. We are calling on the university management to reverse the suspension,” ASUU had said. The ASUU Chairman had pointed out that the hasty action of the University management was capable of bringing the image of the Ivory Tower to disrepute and called on the Rivers state, Governor Nyesom Wike, who is the Visitor of the University to intervene as a matter of urgency. It would be recalled that the abduction of the vice chancellor threw the academic community into a state of shock as unions, associations and groups in the academic community mounted pressure on the police to rescue her. The police did not, however, disclose the exact location of her release or if any ransom was paid for her freedom. She was abducted less than 24 hours after Governor Wike announced the dissolution boards of Governing Council of Tertiary Institutions including Ignatius Ajuru University.